The Powercentric Hinged Polycentric Knee Brace, by Jobst, is an advanced, reinforced knee brace made for those who need support for mild to moderate ligament strains, sprains, and injuries to the meniscus. This includes those whose ACL or PCL ligaments were torn or damaged from side-to-side impacts, hyperextention, or who simply need maximum stability for general knee stability. This brace is a step up from the Jobst Safe-T-Sport Neoprene Knee Brace with Composite Hinges in that it has a polycentric hinge support that has added protection against lateral impacts. But like the composite hinged Safe-T-Sport, the Powercentric knee brace includes a built-in stop to prevent the knee from hyperextending as well as a soft sports neoprene sleeve to slip into. 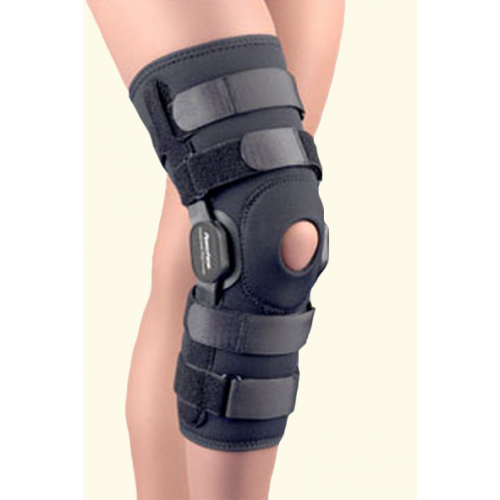 This advanced knee support with its polycentric hinges allow a full range of motion and are lightweight and durable. They are made of ultra-strong composite material and include contoured condyle shells for added side protection during activity. And on the back of the brace is an open space to allow airflow to the knee as well not having the problem of material bunching and irritating the skin. The brace has four straps rather than the traditional two. This will allow an even greater degree of secured placement on both the upper and lower leg portions of the brace. The straps are also hook and loop style so just rip the strap off and cinch it up. 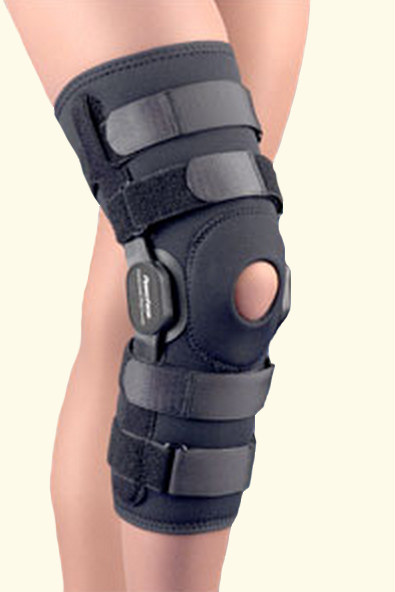 The knee brace will help secure an injured knee, including ligament strains of the ACL or PCL. The polycentric hinge allows a good range of motion for activity. The hinge is protected by condyle shells to guard against lateral impacts. The four straps allow a tighter, more secure fit. It includes neoprene to provide comfort and warmth. Although the brace overall works great by providing me the ability to walk without a cane and with more confidence, there are some issues with it. Why would someone make a knee brace and use plastic D-rings? Problem is...they break with use! Couldn't find any that have metal D-rings, so basically you need to reorder a new one every 2-3 months in order to keep mobile. Supports knee properly, can walk without pain!